Note: This is a guest post written by James Marshall Spector. The following (including, but not limited to, my research, thoughts and opinions) cannot and should not be considered to be actual legal advice in any way, shape, or form. It is offered merely for entertainment purposes as reflections on an interesting legal issue. 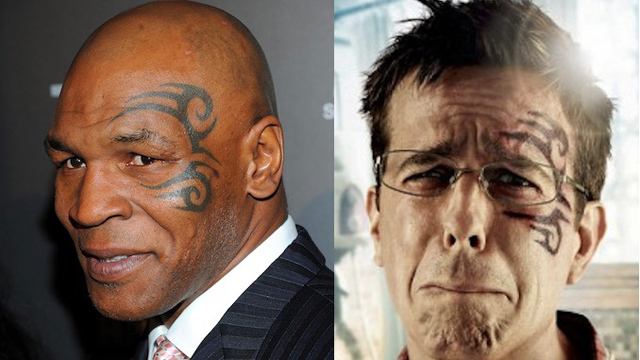 I think it’s fair to say that The Hangover reintroduced a reformed Mike Tyson to the public with his humorous cameo. Besides his ferocious boxing skills in the eighties and early nineties and his battles in and out of court, Tyson is also well known for his face tattoo. If you have seen the trailer for the upcoming sequel, you may have noticed that Stu, played by Ed Helms, sports a very similar facial tattoo. In an interesting turn of events, the tattoo’s artist filed a lawsuit against Warner Bros in federal court, alleging copyright infringement of his tattoo’s design. Whitmill says he created and applied the tattoo to the upper left side of Tyson’s face on Feb. 10, 2003. Whitmill says the boxer signed a release stating that Whitmill was the owner of the tattoo’s design, and says he registered a copyright of the design. Whitmill claims Warner Bros. used an exact replica of his work, without permission, to promote “The Hangover 2” this spring. “On information and belief, the movie features a virtually exact reproduction of the original tattoo, which appears on the upper left side of the Stu Price character’s face, played by actor Ed Helms,” the complaint states. The complaint contains side-by-side pictures of the tattoo’s reproduction and a picture of Tyson’s face. In order to have a prima facie claim, Whitmill will need to prove two elements: (i) the tattoo was copyright protectable and (ii) infringement by Warner Bros. The first issue is whether a tattoo can be copyrightable. To warrant copyright protection, the tattoo would have to be an original work of authorship fixed in a tangible medium of expression. Whitmill claims to have a signed release from Tyson granting him all ownership rights in the tattoo. This should satisfy the authorship requirement. Does the tattoo constitute fixation in a tangible medium of expression? Most likely. The work is fixed when it is “is sufficiently permanent or stable to permit it to be perceived, reproduced, or otherwise communicated for a period of more than transitory duration.” The tattoo is permanently inked on Tyson’s face, thereby enabling another to perceive it for more than just a transitory period. The originality prong only requires Whitmill to have used a minimal degree of originality or creativity. This is a trickier issue. I know very little of these kinds of designs. To me, the tattoo appears to be similar to many other public domain images; however, the court may find the tattoo original enough to meet this requirement. Indeed, they are substantially similar; the entire joke of Stu having a face tattoo relies on its similarity to Tyson’s tattoo. This point, however, will be raised in Warner Bros’s defense that their use was fair. Despite the movie’s commercial release, the purpose of including the tattoo in the Hangover sequel is parodic. In parody elements of the prior work are necessary to create a new work that comments on the former. Not really relevant in this instance because it is parody in nature. An infringer can only use enough of the copyrighted material to conjure up the original tattoo. There cannot be verbatim copying. Here, it clearly is verbatim. This fact may hurt Warner Bros. I don’t think this will effect Whitmill’s tattoo market. In actuality, it may boost his reputation and sales. On the other hand, if he does not get a licensing fee when others get this tattoo, the Hangover’s use may increase copyright infringement. In terms of relief, Whitmill is asking the court for an injunction to prevent the release of the movie and money damages for the infringement. The court will never grant an injunction against a movie that cost millions to make. It just won’t happen so he’ll be left with money damages if he can successfully prove these things. I have to assume that Warner Bros will want this case to go away so they’ll just settle for an undisclosed amount out of court.